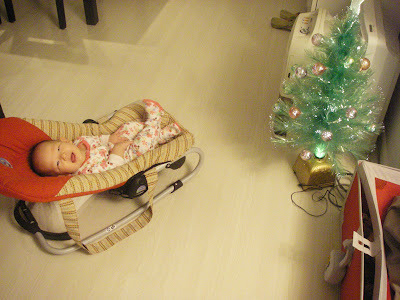 Natalie loves to stare at our twinkling mini Christmas Tree! It mesmerizes her. But if we sit her too close, she tries to sit up to touch it (she can now push herself up into the sitting position while in her recliner). Also, check out Video 54 of Natalie talking while chewing on her favourite giraffe toy. Then she tries to eat the camera.